This represents '#pragma omp declare reduction ...' directive. Here 'omp_out += omp_in' is a combiner and 'omp_priv = 0' is an initializer. Definition at line 102 of file DeclOpenMP.h. Definition at line 106 of file DeclOpenMP.h. Definition at line 203 of file DeclOpenMP.h. Definition at line 200 of file DeclOpenMP.h. Definition at line 198 of file DeclOpenMP.h. Definition at line 199 of file DeclOpenMP.h. Definition at line 144 of file DeclOpenMP.cpp. Create deserialized declare reduction node. Definition at line 152 of file DeclOpenMP.cpp. 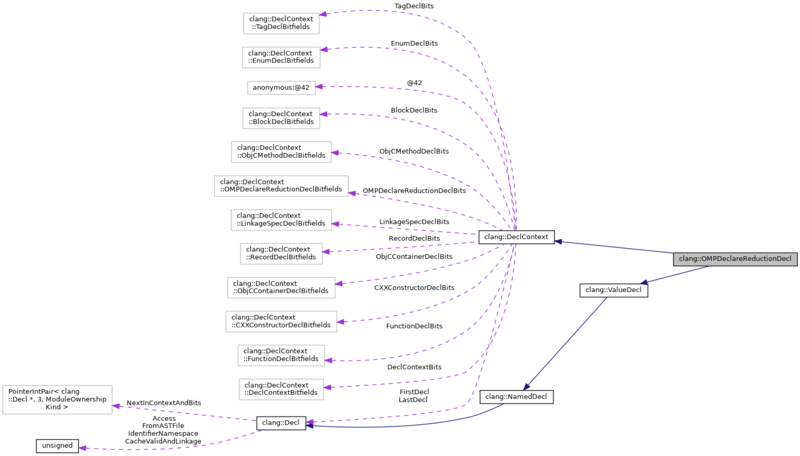 Get combiner expression of the declare reduction construct. Definition at line 152 of file DeclOpenMP.h. Referenced by clang::CodeGen::emitUserDefinedReduction(), clang::ASTDeclWriter::VisitOMPDeclareReductionDecl(), clang::TextNodeDumper::VisitOMPDeclareReductionDecl(), and clang::ASTNodeTraverser< Derived, NodeDelegateType >::VisitOMPDeclareReductionDecl(). Definition at line 153 of file DeclOpenMP.h. Get In variable of the combiner. Definition at line 155 of file DeclOpenMP.h. Referenced by clang::CodeGen::emitUserDefinedReduction(), and clang::ASTDeclWriter::VisitOMPDeclareReductionDecl(). Definition at line 156 of file DeclOpenMP.h. Get Out variable of the combiner. Definition at line 158 of file DeclOpenMP.h. Definition at line 159 of file DeclOpenMP.h. Get initializer expression (if specified) of the declare reduction construct. Definition at line 170 of file DeclOpenMP.h. Referenced by emitInitWithReductionInitializer(), EmitOMPAggregateInit(), clang::CodeGen::emitUserDefinedReduction(), clang::CodeGen::ReductionCodeGen::usesReductionInitializer(), clang::ASTDeclWriter::VisitOMPDeclareReductionDecl(), clang::TextNodeDumper::VisitOMPDeclareReductionDecl(), and clang::ASTNodeTraverser< Derived, NodeDelegateType >::VisitOMPDeclareReductionDecl(). Definition at line 171 of file DeclOpenMP.h. Definition at line 173 of file DeclOpenMP.h. Referenced by clang::CodeGen::emitUserDefinedReduction(), clang::ASTDeclWriter::VisitOMPDeclareReductionDecl(), and clang::TextNodeDumper::VisitOMPDeclareReductionDecl(). Get Orig variable of the initializer. Definition at line 177 of file DeclOpenMP.h. Definition at line 178 of file DeclOpenMP.h. Get Priv variable of the initializer. Definition at line 180 of file DeclOpenMP.h. Definition at line 181 of file DeclOpenMP.h. Get reference to previous declare reduction construct in the same scope with the same name. Definition at line 158 of file DeclOpenMP.cpp. Definition at line 163 of file DeclOpenMP.cpp. 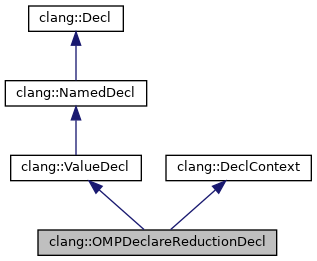 Set combiner expression for the declare reduction construct. Definition at line 161 of file DeclOpenMP.h. Set combiner In and Out vars. Definition at line 163 of file DeclOpenMP.h. Set initializer expression for the declare reduction construct. Definition at line 183 of file DeclOpenMP.h. Set initializer Orig and Priv vars. Definition at line 188 of file DeclOpenMP.h. Definition at line 113 of file DeclOpenMP.h.